On this page are numerous articles from reputable sources reporting on the skull and crossbones displayed on the Pope's inner coffin. Strange as it may seem, after many weeks of researching this, the Vatican has somehow prevented any photos of the pope's coffin that does in fact carry the skull and crossbones of the Masonic order. I wasn't planning on placing this page online until I had the photo. However, due to the fact that many scoffers are claiming online there are no images of a skull and crossbones on the pope's coffin, I have decided to go ahead and post this compilation of articles so as to quench their desires to continue the deception. As research continues, and additional pictures are discovered, rest assured I will be posting them on this page as soon as is possible. In fact, if you know of any pictures of the pope's coffin with the skull and crossbones, please email me. As you can see by the pics on either side of this paragraph there is in fact photographic evidence of this. As you can also see by the many articles on this page it is in fact true, the Popes are indeed Freemasons. Gruesome pictures of a Church in Kutna Hora, Czech Republic. Pics~ More skeletons of Rome decorated with jewels! Pics~ Roman Catholics pray in front of a "holy bone"
Saint Peter's Bones on Display as Pope Francis Marks "Year of Faith"
A Roman Catholic Priest was describing the burial of the Pope to Matt Lauer on the Today show. The Priest said that the Pope will be buried in the Vatican, with a real skull and crossbones over him as a Symbol of where we all return. QUESTION: Is it true that the pope's body was placed in other caskets before it was placed in the crypt? I have heard that one is of wood and another is marked with a skull and cross bones. Why would skull and cross bones be used? ANSWER: Pope John Paul II's body was interred in three caskets. The triple caskets reflect longstanding tradition for the burial of popes. The innermost casket--the one in which his body lay during his funeral--was made of cypress wood. That casket was placed inside a second casket made of zinc (traditionally, lead was used), presumably to seal the body from the ravages of insects. The third, outermost casket was made of walnut wood (the traditional wood was elm). The second casket bears a skull and crossbones, along with John Paul's regnal dates. In Christian iconography the skull and crossbones symbolize death, but they are also a symbol of Adam, the first man, who, according to Christian legend was buried at Golgotha, directly underneath the place where Jesus Christ was crucified. That is because Christians believe that Christ is the new Adam, whose death atoned for Adam's sin and who represents a new template for humanity. Just as Christ conquered death in his resurrection, so will all Christians on the last day. Many crucifixes and paintings of the Crucifixion depict Adam's skull underneath the cross of Christ. Aside from symbolizing victory over death, this skull more specifically represents the skull of Adam, said in Jewish and Christian legend to have been buried at Golgotha, where Jesus was crucified. The Blood of Christ, the New Adam, redeems man, as symbolized by the skull of the First Adam. I Corinthians 15:22, 45: "And as in Adam all die, so also in Christ all shall be made alive...The first man Adam was made into a living soul; the last Adam into a quickening spirit." Funeral ceremonies for a pope last nine days, a period called Novendiales. Details are set by the College of Cardinals, but some basic rules on handling the death of a pope were started in the 14th century because of a history of deceit, disorder and crime associated with papal deaths. Further guidelines are set by past church documents and the pope’s will. Cardinals worldwide are formally summoned to Rome.The camerlengo locks the papal apartments for security reasons.The chamberlain finds the pope’s ring (used as a seal for documents), which will be destroyed in front of the College of Cardinals to prevent forgeries. He also drafts a death certificate. Confirming the pope’s death, the Cardinal Camerlengo — or chamberlain — may or may not follow the traditional practice of tapping the pope’s forehead with a silver mallet. After its enbalming, the pope’s body is placed for public viewing in St. Peter’s Basilica. The Vatican plans a Mass at 10:30 a.m today (Rome time) for Pope John Paul II. The gold papal Ring of the Fisherman shows St. Peter — the first pope — fishing in a boat. The College of Cardinals begins its daily meetings to govern the church until a new pope is elected. They will decide funeral details, destroy the papal ring and plan for the election. Elm signifies dignity.The middle lead coffin is engraved with a skull and crossbones. Innermost cypress coffin signifies pope’s humanity. The casket is installed in its final place in the lower crypt level of the basilica. A cypress coffin is set inside two other coffins, each with different meanings. The chamberlain may allow photographs only after the pope’s body is dressed in papal vestments. The pope’s funeral Mass is celebrated at St. Peter’s. On each of the eight days that follow, a special Mass is said. The College of Cardinals designates the basilica that will be host to each day’s funeral Mass, and the cardinal to preside. But all cardinals may “concelebrate,” or recite together, the Eucharistic Prayer. As Catholic cardinals, heads of state and hundreds of thousands of pilgrims converge on the Vatican to witness Pope John Paul II's funeral Friday, Vatican experts predict the service will be simple in keeping with Roman Catholic tradition. ''The very same funeral that any Catholic would get today is what the pope will have,'' said Monsignor Kevin Irwin, a professor of liturgy and theology at Catholic University of America in Washington. According to papal tradition, the pontiff will be buried under St. Peter's Basilica in an ancient grotto where popes have been buried since the fourth century. Cardinal Joseph Ratzinger of Germany, dean of the College of Cardinals, will celebrate the Mass, which will be conducted on a platform in front of St. Peter's to accommodate the two million people expected to attend. Ratzinger will also deliver the homily. The service will be similar to the last two papal funerals. It will begin with a procession of cardinals, with the most senior going first, each wearing red vestments and white miters. Some clergy will carry incense, while others will carry a cross or candle. The pope's coffin, traditionally made from cypress, will be brought out of the basilica and placed in front of the altar, liturgical experts say. I, who died in 1978, 33 days after being elected, and whose coffin was also placed on the steps. Prior to the Second Vatican Council, which established liturgical reforms from 1962 to 1965, the pope's coffin was displayed on an elevated platform inside St. Peter's and surrounded by candles. Pope Paul VI requested a less extravagant funeral, Wister said. Heads of state, including Prince Charles, President Bush and President Vicente Fox of Mexico, will likely be seated in front of the casket across the aisle from members of the College of Cardinals, Wister said. In keeping with a traditional Catholic funeral Mass, Ratzinger will sprinkle the casket with holy water, recalling baptism, and swing incense over it before offering opening prayers. In previous papal funerals, a cross and a book of Scripture have been placed on top of the casket, said Monsignor Anthony Sherman, the associate director of the Secretariat for the Liturgy at the U.S. Conference of Catholic Bishops. A candle representing the resurrection of Christ may also be placed at the head of the coffin, Sherman said. ''It's the light that the pope is trying to bring into the world,'' he said. The readings during the Mass will be chosen from the 45 or so readings that are approved for funeral Masses, Sherman said. The readings will emphasize Christ's resurrection, he added. ''With the last pope, it was made explicitly clear that it not be a eulogy, but rather a proclamation of the resurrection,'' Sherman said. The Mass will likely last nearly three hours, a portion of which will be devoted to delivering the Eucharist. During the previous papal funerals in 1978, 40,000 people received communion, said Wister, who was a graduate student in Rome at the time and covered the funeral for CBS News. Irwin was among the priests who waded out into the crowds to administer Communion during the last two papal funerals. ''They have hundreds of priests, because God knows, there's wall-to-wall clergy in Rome,'' he recalled. After the ceremony, an expected 12 pallbearers will carry the coffin into St. Peter's along with a procession of cardinals. Pope John Paul II will be buried with a white silk veil on his face, wearing liturgical vestments and a white miter. Archbishop Piero Marini, a longtime close aide as papal master of ceremonies, has said soil from Poland will not be placed in the coffin, as Polish officials had hoped. The pope's body will be interred in three coffins, one of cypress, which symbolizes humility, one of zinc or lead, to preserve the body, and one of elm, one of the most expensive woods in Italy, conveying respect. The lead and elm coffins will probably bear bronze plates with the pope's Latin name, Ioannes Pavlas II, and the dates of his life. The lead coffin, which weighs 800 pounds, has traditionally been marked with a skull and crossbones, Sherman said. The three coffins will be interred beneath a marble slab in the crypt under St. Peter's. The pope will be buried in the tomb of Pope John XXIII, whose coffin was removed from the crypt after he was beatified in 2000. His tomb now resides on the ground floor of St. Peter's so pilgrims can see it. The pope will be buried nearly six full days after his death. 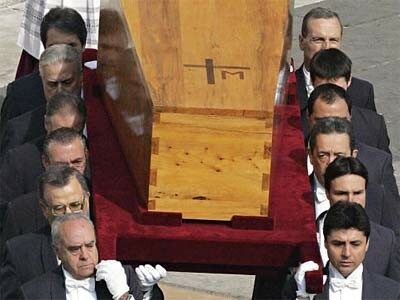 A Vatican official said Tuesday the pope's body had not been embalmed, only ''prepared'' for viewing. Popes have been embalmed in the past, with varying degrees of success. Pope John XXIII, who died in 1963, was reportedly well preserved when his body was exhumed following his beatification in 2000, whereas Pope Paul VI's body began to deteriorate during his viewing. Before the cypress coffin is sealed, a copy of the funeral homily, a notarized death certificate and a summary of the pope's major works are traditionally placed in the coffin. Traditionally, Vatican medals and a bag of coins minted during the pope's 26-year reign are put in the coffin as well, along with the papal ring, which the cardinals crushed after the pope's death. Most recent popes have been buried under St. Peter's Basilica. John Paul II will rest alongside his immediate predecessor, John Paul I. He also will be interred near popes Benedict XV (who served from 1914-22), Innocent IX (October 1591-December 1591), Julius III (1550-1555) and Paul VI (1963-78). My son came home from school today asking what the skull and crossbones represented on the Pope's coffin? Could you please help me out? I have searched and came up with nothing. The skull and crossbones is a traditional symbol of death to denote that the person enclosed within is deceased. The pope’s body is encased in three coffins, placed inside a marble sarcophagus. - Cedar: The cedar inner coffin represents his humanity. - Lead: The cedar coffin is sealed in an 800-pound lead liner bearing a skull and crossbones and a bronze plaque with his name and significant dates in his life. - Elm/oak: The outer coffin is of elm or oak, to signify dignity. 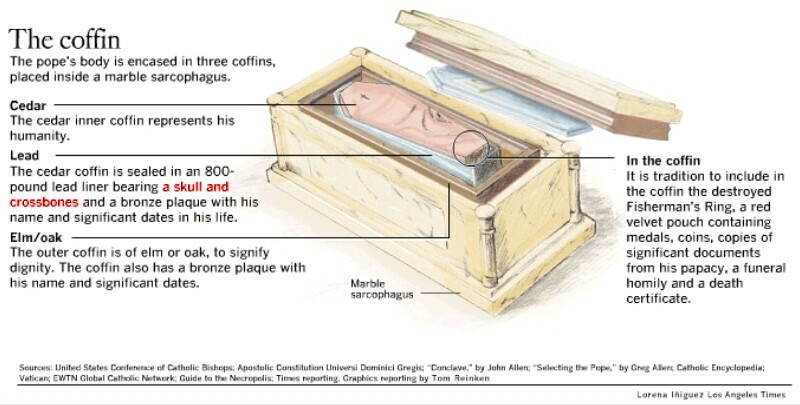 The coffin also has a bronze plaque with his name and significant dates..
ROME -The pope's body is encased in three coffins, placed inside a marble sarcophagus. The cedar inner coffin represents his humanity. The cedar coffin is sealed in an 800-pound lead liner bearing a skull and crossbones and a bronze plaque with his name and significant dates in his life. Details of Pope John Paul II's funeral are unclear, but the funeral of his predecessor was quite interesting. The body of Pope John Paul I, who led the Catholic church for less than a month before dying of a heart attack in 1978, was placed in a simple coffin on top of an oriental rug on the steps of St. Peter's Square. An open book of gospels was laid atop his body, and a white candle, signifying eternal life, burned next to the coffin. Cardinals, wearing red vestments, came by to pay their public respects, visiting in order of seniority. But, as with most papal funerals, the event went beyond such simplicity. After the public viewing, the casket of John Paul I was laid in two other coffins. The first is a lead liner that weighed more than 880 pounds that also includes important papers signed by the pope under the papal seal. The second extra coffin is a massive elm casket, the wood signifying the importance of the person being buried. The lead and oak caskets were embossed with inscriptions giving the dates of John Paul's life and reign, as well as a cross with a skull and crossbones at its foot, and John Paul's personal coat of arms, a shield with mountains and the winged lion of Venice's St. Mark's Cathedral. The word "humilitas" also was inscribed on the two outer coffins. All three coffins then were lowered into a marble sarcophagus and covered by a large stone slab. The tomb is near others that hold at least 144 other popes. The last papal funeral was marked by rain and a strong wind, and even this became cause for graceful ceremony. When the wind picked up, midway through the outdoor portion of the service, eight Vatican attendants carried a canopy to cover Cardinal Carlo Confalonieri, who delivered the Mass. As the rain picked up, attendants behind each of the 92 cardinals in attendance opened black umbrellas. The wind then blew the pages of the holy gospel placed on top of John Paul's coffin and, soon, rain soaked the pages. VATICAN CITY - The funeral for Pope John Paul was preceded today with an intimate ceremony attended only by high-ranking prelates, who placed a pouch of silver and bronze medals of his papacy and a scrolled account of his life in his coffin. John Paul's longtime private secretary, Archbishop Stanislaw Dziwisz, and the master of the liturgical ceremonies, Archbishop Piero Marini, placed a white silk veil over the Pope's face before the coffin was closed. Royalty and dignitaries from more than 100 countries, including Canada, waited outside as the coffin was carried out of St. Peter's Basilica and placed in front of the altar. The book of the Gospel was placed on the coffin. The outdoor funeral mass, which began at 10 a.m. (4 a.m. EDT), was celebrated by Joseph Cardinal Ratzinger, dean of the College of Cardinals. He was joined by the cardinals and patriarchs of the Eastern Rite Churches, all in red vestments. After the mass ended, bells tolled and 12 pallbearers with white gloves, white ties and tails presented the coffin to the crowd one last time, then carried it on their shoulders back inside the basilica for burial. John Paul was buried at 2:20 p.m. (8:20 a.m. EDT) in the grotto under the basilica, attended by prelates and members of the papal household, the Vatican said. The funeral rites were based on the Vatican's book of liturgical ceremonies, published in 2000. The mass began with the Gregorian chant, Grant Him Eternal Rest, O Lord, followed by the singing of Psalm 64 (65), To You We Owe Our Hymn of Praise, O God of Zion. Acts of the Apostles, Chapter 10, verses 34-43, known as Peter's Speech. Psalm 22 (23), "The Lord is my Shepherd, I shall not want." Letters of St. Paul to the Philippians, 3:20-4:1, "But our citizenship is in heaven." John, 6:40, "For this is the will of my Father that everyone who sees the Son and believes in him may have eternal life." John, 21:15-19, dialogue between Jesus and Peter, "Follow me." The homily delivered by Ratzinger followed the Gospel reading. The communion hymn was Psalm 129 (130), "Out of the depths I cry to you O Lord, Lord hear my voice." "Dear brothers and sisters, let us entrust to the most gentle mercy of God, the soul of our Pope John Paul II. ... May the Blessed Virgin Mary ... intercede with God so that he might show the face of his blessed son to our Pope, and console the church with the light of the resurrection." A choir sang the Litany of the Saints. Names of saints canonized by John Paul were included. The patriarchs, archbishops and metropolitans of the Eastern Rite churches surrounded the coffin and offered chanted prayers for the soul of the deceased pontiff and blessed the coffin with incense. After a moment of silent prayer, Ratzinger sprinkled the coffin with holy water and blessed it with incense. The funeral mass ended with all standing and together singing: "May the angels accompany you into heaven, may the martyrs welcome you when you arrive, and lead you to Holy Jerusalem." Once in the grotto, the cypress coffin was definitively closed with red bands, sealed with both papal and Vatican seals. Then the coffin was placed in a second casket of zinc, and subsequently into a third of walnut. This outside casket bears the name of the Pope, his cross and his papal coat of arms. The coffin was then lowered into the ground in a plot inside a small chapel, between the tombs of two women: Queen Christina of Sweden and Queen Carlotta of Cyprus, said a senior Vatican official who attended the ceremony. The service was not open to the public, but was witnessed by top Vatican prelates. The camerlengo, or chamberlain, Cardinal Eduardo Martinez Somalo, performed the rite, concluding with the words: "Lord, grant him eternal rest, and may perpetual light shine upon him." The burial ceremony ended with those present singing the hymn Salve Regina, dedicated to Mary. The reason I posted this last article was to let ALL know the sealing of the coffin where the SKULL AND CORSSBONES is apparently displayed was done PRIVATELY! They admit globally the skull and crossbones is on the coffin, but WHY do they refuse to let the people see it? Could it be it displays a NUMBER as well? Notice the "M" on Pope John Paul II's coffin here? By the way, that is a TRAPEZOIDAL coffin. Those into the occult, especially Vampirism would know the reason for this shape. It supposedly allows for a demonic ressurection if enough evil energy is generated by their god Satan after they die. Looking to the image on the left, one can see where Satanists think the power of their false god stems from. 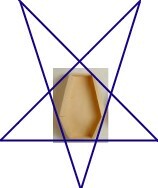 It's the interior of their main symbol the Pentagram. My point here is, notice the letter "M" on the coffin. Now yes, we all know that John Paul II had a "special" devotion" to the Pagan goddess known as "Queen of Heaven" and we all know he claimed it was actually "Mary" the mother of Jesus Christ. He even had his clothing engraved with "TOTUS TUUS SUM MARIA" which in English translates to, "MARY, I'M ALL YOURS." Thing is, nowhere do you see the leyyer "M" prominently displayed by Marionists as a symbol for Mary. Only in the Masonic religion do you see such a display with the letter "M" as being significant. Notice the picture on the right of this page. 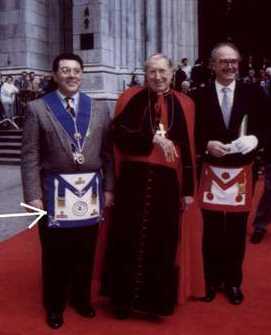 Also notice the letter "M" on the Masonic Aprons. Have you noticed that the "M" on John Paul II's coffin is the exact same font on that apron? By the way... I am still investigating the reason the cross arm on the pope's coffin is longer on the right side. If anyone reading this knows the reason for this please contact this ministry. I recieved an email (04-28-09) that may have answered the question concerning the reason the cross arm on the pope's coffin is longer on the right side. In the 13th. Century there was a found to be a large amount of silver ore in Kutna Hora. People came from far and wide to cash in on their fortune by digging for the silver. However, most died in a plague, which was too much for the local cemetery to handle. So they decided to build a chapel to store the bones of their dead loved ones. Then a Roman Catholic monk came along and started to use the bones for morbid decorations. He of course died before finishing the job. It then fell to Frantisek Rint to finish the disgusting display of death. Over 40,000 bodies were used in this "artwork" of Rome. The cemetery became so famous that some people actually started to donate their bones to the ghastly temple. Notice the Jesuit symbolism (IHS) used in the bones to get a good idea who was truly behind the work. 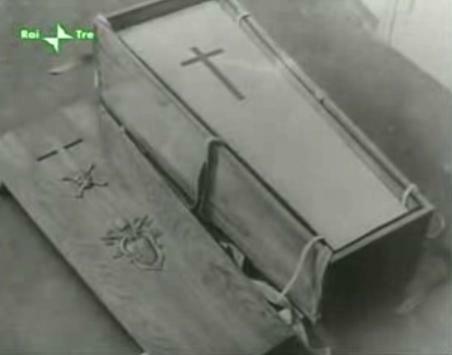 Here is a photo of Pope Pius XI's coffin with the skull and bones. It was gleaned from the end of this video.